The Roman Catholic Church in Russia is part of the worldwide Roman Catholic Church, under the spiritual leadership of the Pope in Rome. Since Rus' (the Eastern Slavic polity that later came to be Russia, Belarus and Ukraine) was converted in 988, before the Great Schism (1054), it is somewhat anachronistic to talk of the Roman Catholic versus the Eastern Orthodox Church in the origins of Russian Christianity. However, the Great Schism of 1054 was actually the culmination of a long process and the churches had been in schism before that (e.g., the Photian schism of the ninth century) and had been growing apart for centuries before that. Several nineteenth century Catholic historians argued that Russia became Catholic at the time of the Baptism, however this thesis has been rejected by most serious historians. Western sources indicate that Princess Olga (d. 954) sent an embassy to the Holy Roman Emperor Otto I.
Otto charged Bishop Adaldag of Bremen with missionary work to the Rus'; Adaldag consecrated the monk Libutius of the Convent of St. Albano as bishop of Rus', but Libutius died before he ever set foot in Russia. He was succeeded by Adalbertus, a monk of the convent of St. Maximinus at Trier, but Adalbertus returned to Germany after several of his companions were killed in Russia. Western sources also indicate that Olga's grandson, Prince Vladimir (d. 1016) sent emissaries to Rome in 991 and that Popes John XV (985-96), and Sylvester II (999-1003) sent three embassies to Kiev. A German chronicler, Dithmar, relates that the Archbishop of Magdeburg consecrated a Saxon as archbishop of Russia and that the latter arrived in Russia, where he preached the Gospel and was Bishop Reinbert of Kolberg accompanied the daughter of Boleslaus the Intrepid to her wedding when she married Vladimir's son Sviatopolk, (known to history as "the Damned" for his later murder of his half-brothers Boris and Gleb). Reinbert was arrested for his efforts to proselytise and died in prison. These embassies to and from Rus' may be the basis for the somewhat fanciful account in the Russian Primary Chronicle of Prince Vladimir sending out emissaries to the various religions around Rus' (Islam, Judaism, Western and Eastern Christianity), including to the Catholic Church in Germany, although the emissaries returned unimpressed by Western Christianity, explaining in part the eventual adoption of Orthodox Christianity. The Russian Orthodox Church has, in fact, had a long aversion to Roman Catholicism. Metropolitan Nicepherus I (1103-1121) also considered Catholicism a heresy; this, in fact, has been the standard view of Catholicism in the Russian church up to the present day and not just among the heads of the church who were often Greeks sent from Constantinople: Archbishop Nifont of Novgorod (1135-1156), for example, in the instructional "Questions of Kirik", responded that a woman who took her children to be baptised by a Catholic (the term "Varangian", that is, Viking, is used) priest was to incur the same penance as one who took them to be blessed by a pagan sorcerer. Other sources, including the Kormchaia Kniga (the code of canon law of the medieval Russian Church) attacked Catholicism as a heresy to be shunned. Up until the time of Metropolitan Isidor (1431-1437), the Russian metropolitans had almost no contact with Rome. This, however, did not mean that there was no Catholic presence in Rus'. The Teutonic Knights and the Brothers of the Sword (subsummed into the Teutonic Order in 1227), Swedes, Danes, and other Catholic powers launched a series of crusades against Pskov, Novgorod, and other towns in northwestern Russia and the Novgorodians fought hard to keep Catholicism out of the Novgorodian Land, not merely due to religious differences, but also because Catholic converts among the Finnic tribesmen and/or the Slavic populace would pay taxes to and be part of the Catholic Churches and Catholic monarchies' administrative structures. Taxes, tribute, or military levies would then go to the Scandinavian kingdoms or the Germanic city-states of Livonia, or to the Lithuanians, and thus reduce Novgorod's wealth and overall security. In the 1330s, Poland took over Volynia in present-day Ukraine and, the Novgorodian Chronicles tell us, converted the Orthodox churches there into Catholic ones. In 1387, the Lithuanians, who had long threatened the western frontier, converted to Catholicism and united dynastically with the Poles. The Catholic Grand Princes, such as Vytautas the Great, attempted to establish separate metropolitanates in the Russian lands they controlled. The Russian church always fought against this, in large part out of fear that the new metropolitanates would be converted to Catholic provinces. Prince Yarslav Vladimirovich and other princes married their daughters to Western princes; one of these dynastic marriages was, in fact, to a Holy Roman Emperor (although the marriage was an unhappy and ultimately failed one). Prince Iziaslav Yaroslavich (1054-68; 1069-73; 1076-78) sent his son to Pope Gregory VII, asking for papal assistance and promising to make Russia a vassal of the Holy See. Gregory's reply letter is dated April 17, 1075. Grand Prince Vsevolod Yaroslavich (1078-93) established the feast of the translation of the relics of St. Nicholas to Bari in Southern Italy, a feast approved by Pope Urban II (1088-99), who in 1091 sent Bishop Teodoro to Vsevolod with relics. Before 1917 there were two dioceses in Russia: in Mogilev with its episcopal see in St. Petersburg and Tiraspol with its episcopal see in Saratov. 150 Catholic parishes were present with more than 250 priests to serve around half a million Catholic believers in Russia. During the 70 years of the Soviet time (1917 - 1987) many Roman Catholic faithful lost their life, were persecuted or sent to imprisonment for their faith. By the end of 1930-s, there were only two functioning Roman Catholic churches in the USSR: Church of St. Louis in Moscow and the Church of Our Lady of Lourdes in St. Petersburg. There are approximately 750,000 Catholics in Russia - about 0.5% of the total population. For those of the Latin Rite there are four dioceses, including 1 archdiocese, plus an Apostolic Prefecture. There is a separate jurisdiction for those of the Byzantine Rite. In February 2002, the Catholic Apostolic Administrations were formed into one archdiocese in Moscow, and three diocese in Novosibirsk, Saratov, and Irkutsk. The Catholic Archbishop of Moscow has voiced his support for religious education in state sponsored schools, citing the examples of other countries. Relations with the Russian Orthodox church have been rocky for nearly a millennium, and attempts at re-establishing Catholicism have met with opposition. Pope John Paul II for years expressed a desire to visit Russia, but the Russian Orthodox Church has for years resisted. In April 2002, Bishop Jerry Mazur of Eastern Siberia was striped of his visa, forcing the appointment of a new bishop for that diocese. 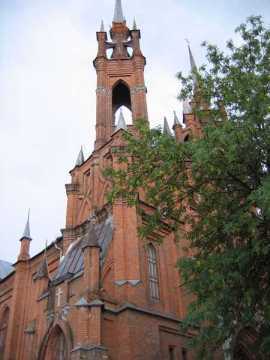 In 2002, five foreign Catholic priests were denied visas to return to Russia, construction of a new cathedral was blocked in Pskov, and a church in southern Russia was shot at. On Christmas Day 2005, Russian Orthodox activists planned to picket outside of Moscow's Catholic Cathedral, but the picket was cancelled. Despite the recent thawing of relations with the election of Pope Benedict XVI, there are still issues such as the readiness of the police to protect Catholics and other minorities from persecution. One thousand Russian Catholics gathered in the Virgin Mary's Immaculate Conception Cathedral in Moscow to watch the Pope's funeral. A 2004 Ecumenical conference was organized for Russia's "traditional religions" Orthodox Christianity, Judaism, Islam and Buddhism, and therefore excluded Catholicism. This page was retrieved and condensed from (http://en.wikipedia.org/wiki/Roman_Catholicism_in_Russia) see Wikipedia, the free encyclopedia, January 2008.